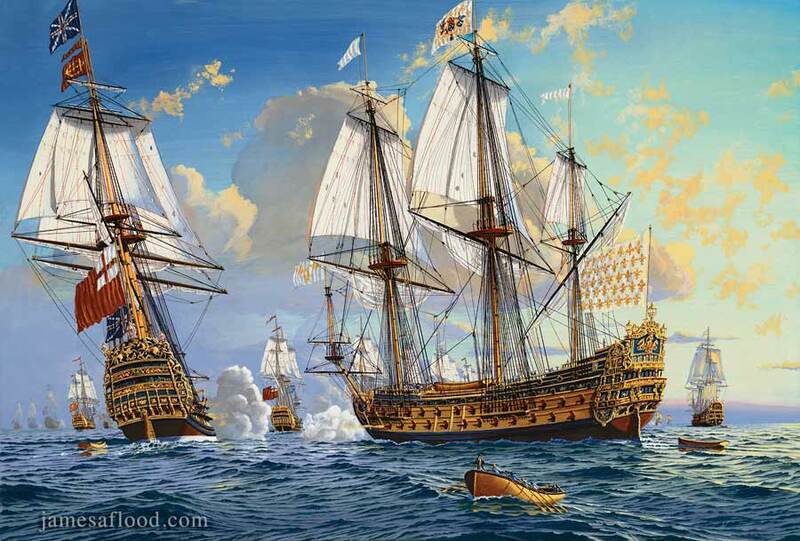 The scene in this painting depicts Soleil Royal and Britannia exchanging fire during the Battle of Barfleur in 1692. Lead by Adm. Tourvilles and sorely outnumbered, the French fleet, purportedly under order from King Louis XIV, attacked the Allied fleet, which consisted of Dutch and British ships. The battle was fierce, and in the end, the French, overwhelmed, were forced to flee, splitting into two groups. Soleil Royal, the flagship of Adm. Tourvilles, along with eleven other French ships were pressed by the Allied fleet and driven ashore at Cape La Hougue. The Allied fleet brought up their fire ships and destroyed Soleil Royal along with the other eleven French ships in the surf off la Hougue. The remainder of the French fleet, caught in the famous tidal race of Alderney, were swept to the west where they took refuge in various creeks, some driven ashore.